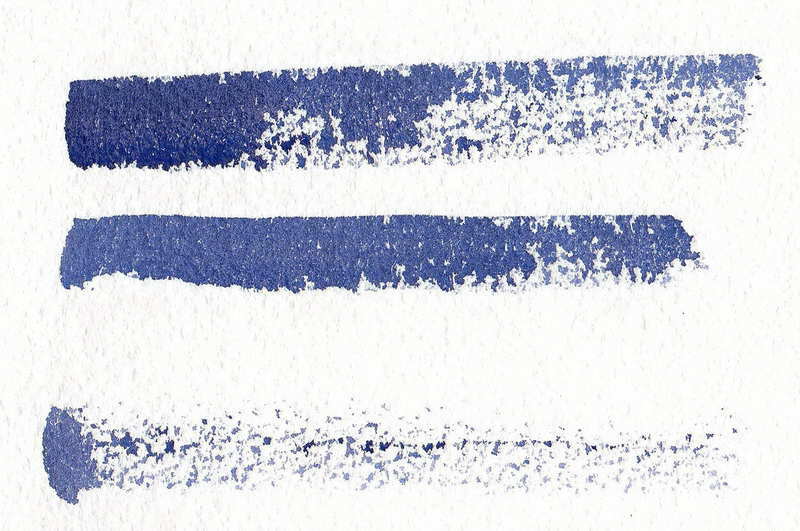 This edge, samples of which can be seen in figure 7, is created by sliding the brush quickly across the surface of your watercolor paper. There are a number of variables however which affect the final result you achieve. If you are using a round brush as in these examples, you can use the point of the brush, the side of the brush with the point touching the paper as well, or use you use just the bulb part of the brush without the point touching the paper. Other variables when using dry brush or broken edge watercolor painting techniques are the angle of the brush to your paper, the texture of your watercolor paper ( Rough, Medium also know as Cold Press or NOT, or Smooth), the brush you are using and the amount of water in your brush (how wet it is). The speed of your brush stroke will also greatly affect the dry brush result. Dry Brush or Broken Edge brush strokes are great ways to add texture to a scene, such as sparkle on waves at the sea, rough bark on a tree, texture on a road surface, etc, etc. The more you practice creating dry brush strokes the more you will use them to add interest to your watercolor paintings.